Over the last couple of weeks I’ve been working on a small e-book as a learning exercise. This is not learning how to write a book, but how to get a manuscript formatted as an e-book, with a cover, etc and uploaded to a platform for sale. It turns out that it is fairly easy to do but, like many things, the first time you do it takes a lot longer. 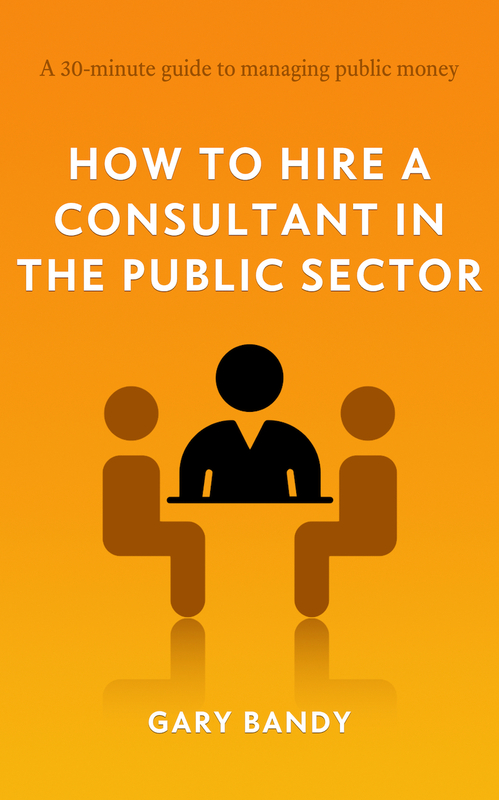 I wrote an e-book about procurement in the public sector, using the example of hiring a management consultant or advisor. I did this because it seems like the sort of thing a manager might do in pretty much any part of the public sector. Schools, hospitals, local councils, police forces, etc will all use advisors from time to time and they all have to follow the same process in broad terms. What I mean is, they all need a specification, a tender or quotation process, an evaluation, and an award process even if all of them have their own specific rules. They also all need to manage the consultant once appointed, an aspect often overlooked. Before I could export the epub from Ulysses I had to create a cover. I could have commissioned an artist to create a cover for me but that would cost potentially more money than I might make from this test book so I made my own. I’m not a great graphic artist but I know a bit about using an app like Pixlmator so that’s how I created the cover you can see below. Once I had a cover I had to incorporate it into the export function in Ulysses and, bingo, I had an epub file. Amazon Kindle does not support epub files so I then had to run my epub file through an app called Kindle Previewer in order to convert it into the mobi file type that Kindle does support. The next part turned out to be the hardest and longest step in the whole process. I thought I would be able to use my accounts with iTunes and Amazon to upload the files and click a few buttons to add prices etc and that would be that. It is sort of like that except the first time you need to get yourself an American tax identification number in order to benefit from the tax treaty between the UK and USA. As American companies Apple an Amazon would hold back 30% tax from any royalties that I earn unless I registered with the IRS and claimed an exemption under the tax treaty. On that basis they would withhold 0% tax and I would have to pay only the UK tax on the income. That took a fair bit of research, the completion of a form, a long phone call to the IRS to explain what I was doing, etc. To be fair, at the end of the call I was given my ID number and could use it directly in the Amazon and iTunes set up pages. After that is is more or less a case of uploading the file, entering meta data, marketing blurb, pricing information and a publication date and the book will be published. If you are interested in reading this book about public sector procurement click on the following links to get it from Amazon or the iBookstore.